The Shamisen is a very unique instrument born in Japan at the end of the 16th century. It has three silk strings and a large plectrum (called a bachi) to strike them. Also, Shamisen has a distinctive sitar-like sound called “sawari” which is the resonance from the thickest string lightly touching the neck. The sound from strings, body and sawari combine to make the Shamisen unique. The Shamisen became wide spreading in Edo period (1603-1868 CE) and is now played not only in Japan, but all over the world and played alongside ethnic and electronic musical instruments. Now, Shamisen is a tool of communication in the world. 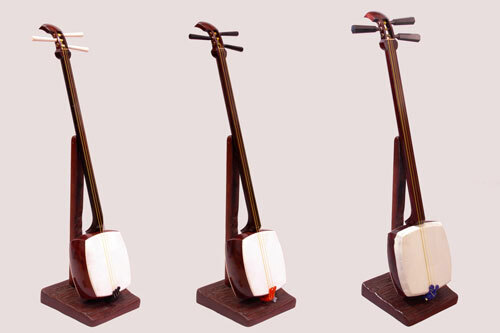 We provide you all kind of Shamisen. Please ask our e-mail:info@shamisen-katoh.com. Our computers interpret foreign e-mail as spam. Please write “Shamisen” for the subject/title. Copyright (C) Shamisen Katoh All Rights Reserved.